Pancit bihon is often referred to as “birthday noodles” on Chinese restaurant menus in the Philippines. 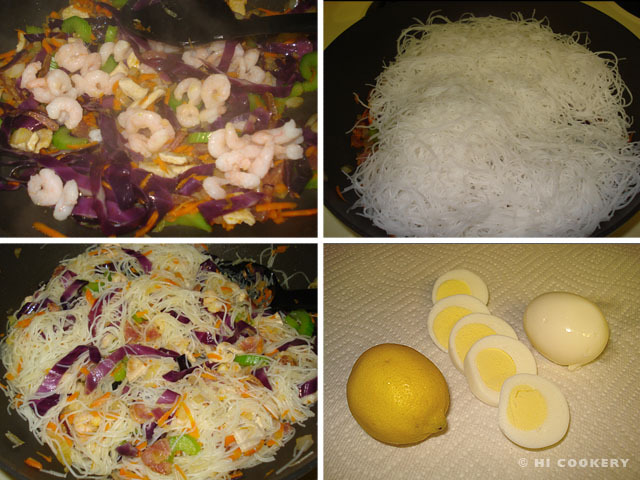 This rice vermicelli dish, stir-fried with shrimp and a mix of meat and a variety of vegetables, is frequently found at Filipino fiestas, especially at birthday parties, because the noodles symbolize “long life”. It also looks colorful like the confetti at a celebration. Pancit is derived from the Chinese pian i sit (translated as “something conveniently cooked fast”). Bihon (rice noodles) is the Filipino term used to distinguish the type of noodles used in the recipe, such as canton (egg), palabok/luglug (thicker noodles), etc. Islander’s parents always prepared pancit for her family’s birthdays and continue to cook it for special occasions because of its symbolism. We eat different kinds of pancit at Filipino and Chinese friends’ events in the Philippines and Hawaii as well as on the mainland. We make it at home, too, when we just crave cultural cuisine for a change. Although it takes some time to get the ingredients ready, the process for cooking it is really fast. Prepare pancit bihon for birthdays, special occasions and National Noodle Day—and have oodles of noodles and good luck for a “long life”. 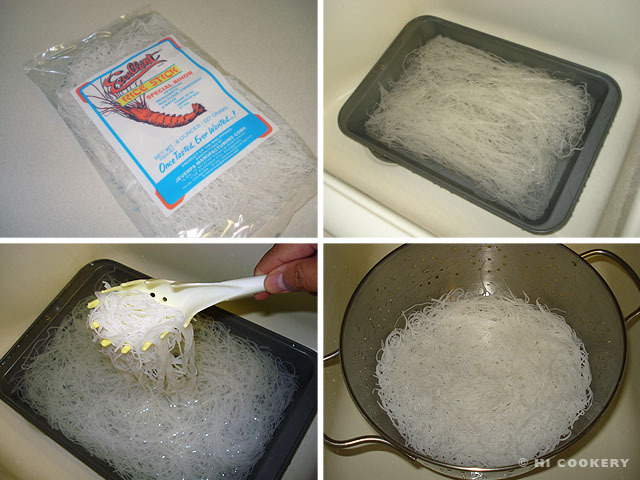 Soak the dried noodles in hot water for about an hour or until softened. Drain well. Prepare all the vegetables. Peel and crush the garlic clove, chop the onion, julienne or roughly grate the carrots, thinly slice the celery stalks and shred the cabbage. Also, slice the sausage and meat thinly. Shell the shrimps, if necessary. Heat the oil in a wok or large pot. Saute the pork or chicken meat until no longer pink. Add the sausage and cook well. Mix in the garlic and onions and stir until softened. 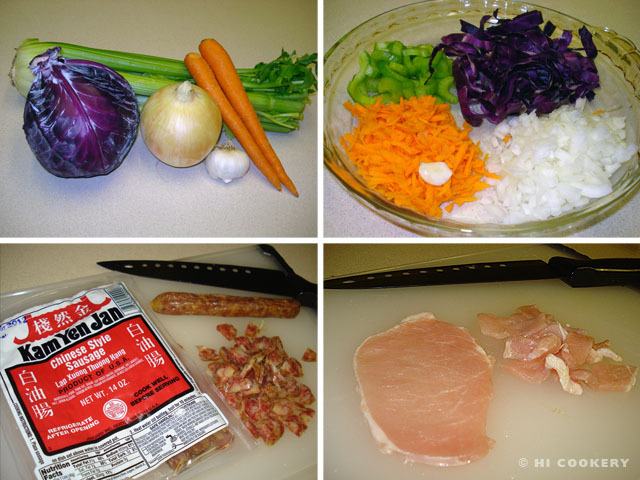 Add the carrots, celery and cabbage and mix well. 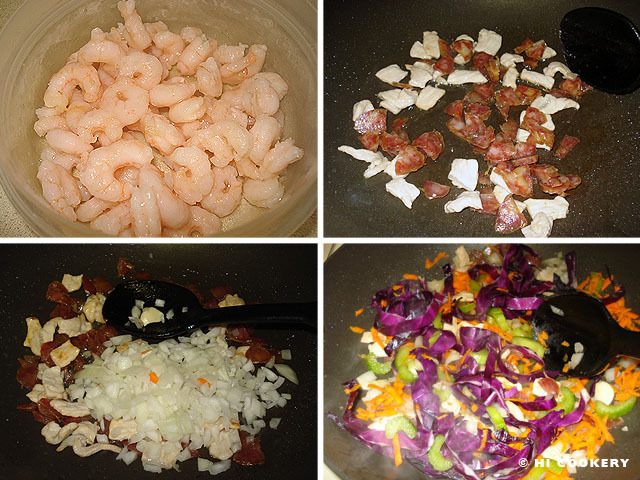 Stir in the shrimp. Season with salt, pepper and oyster sauce. Add the drained noodles. Gently mix until blended with the other ingredients. Stir in the soy sauce to add a little color and taste. Transfer to a serving platter and garnish with sliced boiled egg and calamansi or lemon wedges. This dish is also named pancit bihon guisado. Guisado is derived from the Spanish guisar, which means “to saute”. Filipino foods are influenced by colonial Spain and neighboring China. Avoid overmixing the noodles or they will break into short pieces. Keep the strands long for the symbolism. Squeeze the juices from the calamansi or lemon wedges before eating to bring out the flavor of the pancit bihon. Leftover pancit, if there is any remaining, tastes great, too, because the ingredients have blended well together. As a time-saver, this dish can be made a day before the party then reheated and garnished with fresh slices of boiled egg and calamansi or lemon wedges. 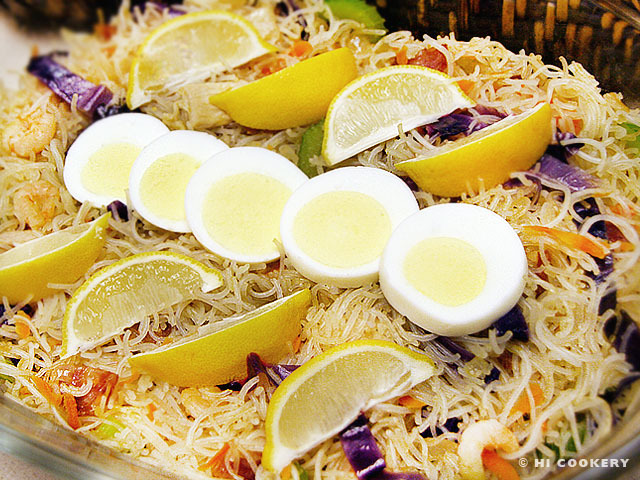 People enjoy taking home plates of leftover pancit after a party for another meal at home and for sharing in the “long life” lucky symbolism.